OK, it's not Friday. But pretend it is, and I'll post a Science Friday video anyway, k? "Visit Robert Sabin's pumpkin patch: he has been growing giant pumpkins for over ten years. But these pumpkins just aren't meant for the pie pan: Sabin says they're more like children than fruit to him. He raises his pumpkins for competition--the heavier, the better. Does his top pumpkin have the heft to win the Long Island Giant Pumpkin Weigh-Off at Hicks Nurseries? We'll find out." "Carve first, scoop later--that's just one of the tips from Maniac Pumpkin Carvers Marc and Chris. Based in Brooklyn, these professional illustrators switch to the medium of pumpkin during October. Their pumpkins, which go for between $150 - $400, rarely end up on stoops. You are more likely to find them in Tiffany’s ads and in window displays. They gave us some tips for how to bring our pumpkins to the next level this Halloween." The Science Museum's mummy will be taking a little trip to Children's Hospital tomorrow afternoon to undergo a CT scan. We hope to come away from the scan with a 3D model of the mummy’s inner workings and new clues that reveal more details about his life, a more precise age and cause of death. The results will be developed into new interpretative tools that will make their debut in the months leading up to the opening of the King Tut exhibition. WCCO-AM will also be airing an interview with Ed Fleming about the project during news breaks today and tomorrow. "Pumpkins of the Atlantic Giant variety can weigh more than 1800 pounds. For a mechanical engineer with an interest in plus-sized fruit, like Georgia Tech’s David Hu, this raises an interesting physics question: how can the pumpkin get so big without breaking?" Jackalope 1Courtesy JoeI moved recently. And I love my new neighborhood. Great neighbors, lots of kids for my kids to play with and my backyard is frequented by a real live jackalope. I am obsessed with jackalopes. I don't know why. In the old Science Museum of Minnesota there was, at the end of the skyway, a rack of display cases and one held a jackalope. I would just sit and stare at that thing - for whatever reason it fascinated me. Jackalope 2Courtesy JoeAnd then a group of my coworkers gave me a mounted jackalope head that hangs in my cube. And now one hangs out in my back yard. And it is awesome. Though a little camera shy. Jackalope 3Courtesy JoeJackalopes don't have antlers like a deer or moose - in fact they are not meant to have the "antlers" at all. The growths are the restult of the Shope papilloma virus which causes tumors to grow on the rabbit’s head. Interestingly, Shope papilloma virus provided the first model of a cancer caused by a virus in a mammal and has been used to help develop the HPV vaccine and investigate antiviral therapies. 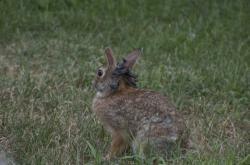 Here’s a link to a couple of photos of rabbits that have more severe cases of the infection. Hmm. Vampires are sort of cool. Quick! Someone get a brick in her! : Oh, Edvard...Courtesy Edvard MunchHalloween is right around the corner, and everybody has ghouls and ghosts on the mind, so naturally this story caught my eye today: “Vampire” discovered in mass grave. You know how they could tell it was a vampire? Come on, guess. Moldering eveningwear? Not that the article mentions. Batty features? Wooden stake in the ribs? Crosses and garlic? A brick in the mouth. Duh. Yeah, one of the skeletons in a Venetian mass grave of plague victims had a brick in its mouth, making it a vampire. And the age of the grave (the plague hit Venice in 1576) makes it possibly the oldest vampire. Some explanation may be in order, but I’m afraid that I might not be able to offer up anything totally satisfactory. According to the article, at the time of the “vampire” woman’s death, it was thought that vampires didn’t actually drink blood, but spread the plague by chewing on their shrouds after death. I’m not sure how that spread the plague (maybe they traded shrouds afterwards? ), but gravediggers at the time would put bricks in the mouths of “vampires” to stop them from doing this. Something seems to be lacking in that explanation, but, still, it got me looking into vampire folklore, which is kind of gross and awesome. 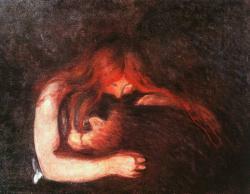 Ghosty vampirey stories go way back into folklore, but when people started connecting them with actual dead bodies, things got to be pretty interesting. Folks suspected a vampire when they dug up a body that didn’t appear to have decomposed the way it should have. (Don’t ask me why they were digging up bodies in the first place.) Bodies can decompose in all sorts of ways (check this post out for an icky example) depending on soil conditions, etc, so sometimes people might find a body that would be swollen, or starting to turn dark, or where tissue had contracted to give it a strange expression, or expose more if its teeth—that sort of thing. Blood (and blood-like stuff) might sometimes well up in a dead person’s mouth, giving the impression that they had recently been out eating something ghastly. If the body was jostled, trapped gas escaping through the mouth (or any orifice…) could make life-like sounds. And if any body tried to put a stake into the body, those same gases could cause a really exciting, messy situation. Original descriptions of vampires follow this rotting-corpsey theme. Instead of being gaunt and pale, they were described as bloated and dark or ruddy-colored, and they walked around in shrouds causing trouble (which, I think, is way creepier than a guy in an opera cape). Another archaeologist (back to the article here) pointed out that it’s a neat find, but it’s not necessarily the “first vampire,” as there have been similarly dated finds in other European countries. I’m still a little confused about the brick-mouth and plague thing. Maybe the brick was there to stop general vampire mischief, and the fact that it stopped the undead from spreading the plague was a bonus. In St. Paul! : A rabbit exhibiting growths resulting from the Shope papillomavirus.Courtesy LizaWhen I was a visitor to the “old” Science Museum of Minnesota my favorite exhibit, for whatever reason, was the case that had jackalopes in it. I would insist that we wait until the line to enter the Omnitheater got long enough so we would wait to enter the Omni right by the jackalope case so I could it and stare at it. Sort of weird now that I look back on it…but even today they for some reason fascinate me and I have a jackalope hanging in my cube. Anyway, the cool thing is that while jackalopes are not real, there is an actual virus that infects rabbits that causes growths on or near the rabbit’s head, which may be the origin of the myth of the jackalope. And the super awesome thing, I think, is that a coworker, and fellow Buzzketeer Liza, has a rabbit with this condition living in her neighborhood and she got this amazing picture of it! The jackalope in my cube.Courtesy JoeThe virus that causes the growths, Shope papillomavirus, was discovered by Dr. Richard Shope in the 1930s. When the virus was sequenced in 1984 it showed substantial similarities to the human papillomavirus (HPV) and as a result has been used as a model to develop the HPV vaccine. 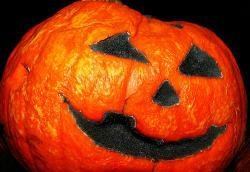 Pumpkin rot: It happens every year, and it's always sad. And gross. (Photo courtesy of Orbitgal on flickr.com)I carved a jack-o-lantern this year. It was both elegant and understated, festive and expressive, a true tribute to the holiday we call Halloween. I would have replaced my own head with this carved pumpkin, were it necessary. I carved this work of art only the day before Halloween, and left it at my mother’s house. I like to think of it as a gift, even though my mom bought the pumpkin. Come to think of it, I should have tried to sell it back to her. Anyway, I left, and the pumpkin stayed. Early last week my mom left on a road trip (where to, I have no idea - she’s like the wind). She left my jack-o-lantern sitting in the kitchen, no doubt hesitant to throw out such a wonderful gift from her son. Six days later, however, when I came back to water the plants and to check if the cat was still alive, the pumpkin was no longer the object of beauty it had been. It was saggy and blotchy, rubbery and slick. Its once bright eyes were blocked with black mold, and downy white mold feathered out from between its jack-o-lips. When I poked it, sticky pumpkin juice drooled out of its mouth, and spores puffed from its eyes. I hate to use the word for any of my creations, but it was gross. fig. 2: A JGordon original. Prints for sale soon. Being the good son that I am, I decided that I would take care the vegetable abomination myself (I’ll bill my mom for it when she gets back). The job required a shovel, because it was a little too, oh, fally-aparty to pick up with my bare hands, but, without too much trouble, I was able to bring my sad jack-o-lantern to the final resting place of all good pumpkins: the woods behind the house. The whole situation was certainly rife with potential science projects on organic decomposition and fungi, but I was too focused on getting the thing out of the kitchen to think about it at the time (and, later, I was too focused on how fun it is to lob shovelfuls of moldy pumpkin at trees). Fortunately, I’m not the first person to become interested in the disaster that is a November 10th jack-o-lantern. Here we have a science project that determines the best ways to keep your jack-o-lantern fresh and looking sharp, from soaking it in bleach to coating it with Vaseline. It’s complete with photos of the pumpkins at various stages of decay – very nice. There are some other interesting projects on the site as well, but some of them are not entirely family friendly, so the delicate among you might want to proceed with some caution. I’m sure you would anyway. And this site features a do-it-yourself pumpkin mold project for any children who feel like the weekend is too long to spend away from science class. Zombies - not so impossible? : Image courtesy lebovox via Flickr. Okay, I'll grant that the scientific research conducted by Cracked magazine may not be the most top notch stuff, they do have links to some pretty cool articles that have actual science in them in this totally awesome article about how zombies could actually happen. I love zombies and zombie stories. And Halloween. This article is perfect joy for me. Though readers beware, they do use some off color language occasionally. 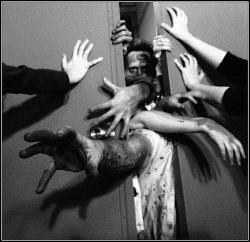 UPDATE MARCH 2011: Popular Science answers the question: Could Scientists Really Create a Zombie Apocalypse Virus? Ahoy, Buzzketeers, ahoy and aloha. JGordon here. 1)	You’re wrong. Y’all are dead. 2)	This is a science blog, so lets do our best to rein it in a little. In a sciencey way, you know? Ok, to my first point—come on, folks, really? A gun shop? Go to a gun shop? That’s the plan? Let’s think about this. What’s more dangerous, a staggering, slack-jawed zombie, or a desperate scared person, who will do anything to get/keep a firearm? Probably the crazy person with the gun. Clearly you aren’t the only person to think, “gun store,” so… you want to head to the place where there will be lots of freaked-out people and relatively few guns? Hmm. You’ll have to tell me about it later, because I think I’ll skip that. Or a zombie-plow? It’s a delightful thought, but, I dunno… I’ve never actually had to drive plow through a crowd of un-feeling undead, but I wonder how long you could go before that plan fell through. Not to get too morbid, but that stuff is going to get stuck under your car, and some point you’re going to have to deal with it. Plows are for snow, not for hundreds of bony, 160-pound zombies. Let’s separate ourselves from the future lunchmeat by being a little original. Which brings me to my second point: science, dudes, science! Are you really going to pull off that headshot when the pressure is on? Have you ever considered how hard it might be to destroy the brain of a zombie with your old Louisville Slugger? Maybe you’re not the fighting type. (I’m not.) Or maybe you can fight zombies until the cows come home, but what about everyone else in your group? So how are you going to keep yourself alive? Invest some thought into zombie evasion. What techniques could you use to avoid inviting the attention of the hungry dead? Might there be a way to avoid their detection all together? Do zombies find you through sight? Or smell? Do they hear you? How would you disguise yourself, and how would you test out your methods without getting eaten? Unfortunately, humanity doesn’t have a lot of real-world experience with zombie attack. But maybe we could find a useful analogy in nature. How do other organisms cope with the constant threat of being eaten? What survival techniques have kept them alive? How could we mimic them, or adapt them to the zombie threat? And what about the endgame? Do you simply run from empty gun store to empty gun store until your luck or your food runs out? If you fortify an area, making it zombie proof (and how would you do that, exactly? ), what could you do to ensure that you had food, water, and power for years to come? Or do you want to save the world? How are you going to figure out what’s causing the zombie infection? How are you going to cure it? If most of the world is infect… can it be cured? Or must it be quarantined? There’s a lot of things to consider here, and “my dad has a gun” isn’t one of them. So, people, lets use our brains before the zombies do. (As it were.) How are science and scientific knowledge going to get you through the zompocalypse? Only science will save us from the zombie apocalypse! And only science will save your comment from being deleted. Let's see some zombie science!